If you take up riding in your 30s or 40s as many of us do, one area you need to focus on if you want to advance, is to learn some bike skills. As children most of us rode a bike, but the majority of us were not formally taught, so we didn’t have the chance to learn any bike skills and this particularly applies to women. In my experience in meeting many female cyclists, women tend to approach cycling quite differently to men. Although many of us rode bikes as kids we usually did a few laps around the neighbourhood and didn’t jump off gutters, perform wheel stands or other daredevil acts like our male counterparts. The good news is that it’s easy to improve your bike skills. Here’s a few tips on how to improve your skills in areas like cornering, pedalling, safe braking, descending, climbing, riding in a bunch and more. Cycling clubs offer training skills coaching in formal and informal ways. 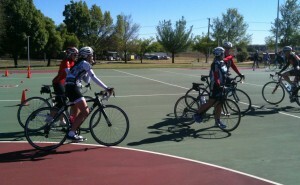 The informal is the advice you are given on club training rides. This can be useful, but it can also be counterproductive because well meaning individuals don’t always know what they are talking about. What you need to do is make sure the person who is dispensing advice has some credentials in their own right, like they’ve been riding and racing for many years, or better still have some experience in coaching. So make sure you filter this information but don’t right it off altogether. Another great way to learn skills is through workshops, skills days, training camps, etc that are offered through clubs and cycling groups. There are opportunities to attend skills workshops and sessions but they are not always easy to find and are held infrequently. Cycling NSW in conjunction with a few very motivated female coaches has held training camps and weekend skills sessions on an infrequent basis, so if you’re NSW-based look out for these. In a recent survey conducted by Cycling Australia of female riders, there was a strong sentiment from Cycling Australia members for more advanced skills training and racing skills training. Women prefer to develop their skills first and then dip their toe in the water. And if you can’t get to a workshop or course there’s plenty written about cycling skills like the Master Classes in Bicycling Australia magazine. Every issue has a skills session often written by a professional rider. One way to advance more quickly and to improve your skills is to hire a coach. You don’t have to be a top tier athlete to benefit from working with a coach, and it also doesn’t have to break to budget. You can work with a coach over a short or long period depending on your requirements, and the program is tailored to your specific needs. We often have the image of a professional athlete training one-on-one with a coach standing beside them. In reality if you hire a coach you’re more likely to meet up with them once and then communicate via phone or email for subsequent meetings. You can log all your training sessions into a site like Training Peaks and your coach can give you feedback and track your progress. Ask around amongst fellow cyclists who will be more than happy to provide recommendations. You may be surprised at how many other riders have coaches or have been coached at some time. If you don’t want to take the plunge and hire a coach there are plenty of great resources on the Internet and in books about coaching and developing your own program. Once you’ve learned some of the techniques then you need to put them into practice. The best way to do this is to find a quiet car park and practice skills like U-turns, safe braking and more. You can also find a suitable corner and keep going around it until you feel it’s been mastered. The same can apply to hill climbing and descending. Practice, practice, practice. You can also ask a few friends to join you. They’ll also benefit from the skills practice and you’ll learn from each other at the same time. You need to set yourself a goal before you can begin working towards it and this applies to improving your skills just as much as any other aspect of cycling. Without a specific goal you might as well just continue to be a keen recreational cyclist. There is of course nothing wrong with that, but if you’re serious about training you need to know where you are heading. Once you’ve set your goal you can then work out what skills you need to improve in order to achieve it. Above all else, make sure you get out on your bike at least two or three times per week. There’s really no substitute for repeating something over and over to get the hang of it. You’ll gradually improve in your skill level and your confidence will increase at the same time.